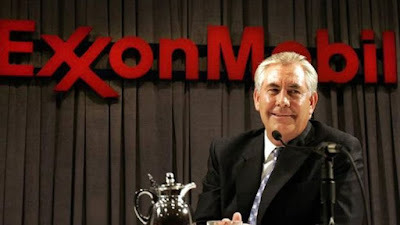 Ex ExxonMobil CEO, Secretary of State Tillerson stands solidly on the side of climate change. Sceptics Funded by Big Oil -no, the Alarmists are. And most often in the liars' disinformation, BigOil is represented by ExxonMobil. eg: Donald Trump Pledges to Rip Up Paris Climate Agreement. Gee, then POTUS Trump appointed Rex Tillerson (ex-CEO ExxonMobil) as Secretary of State. U.S. Secretary of State Rex Tillerson signed his name Thursday to a document [Fairbanks Declaration] that affirms the need for international action against climate change, adding further uncertainty to the direction of climate policy under the Trump administration. Obviously, Alarmist claims that BigOil promotes Climate Realism is wrong. And what happens to Trump administration solidarity? I've been following this drama quite closely over the past few weeks and it looks like the Socialist left's (Soros funded and manipulated) MSM's continuous anti-Trump propaganda and Rent-a-Crowd protests etc., have been well worth their effort. Ignorant CAGW believers like Tillerson certainly aren't much help to anyone. If Trump does renege on this one, I hope the leftist hate-mob win their ultimate goal: to see him impeached! If Trump had any gumption or any moral principles, he'd award the same prize to Tillerson that he just awarded ex-FBI Director James Comey. Donald Trump won the US presidency mainly because he was Western Society's last hope to restore global sanity and it looks like he's about to betray us - he has all but let the globalist bigots win. Things are likely to become rather ugly over the next few weeks and months ahead, where the US could soon be listed by sites such as Smartraveler.gov.au as another 'Do Not Travel' country, not unlike Afghanistan, Syria, Libya, Sudan and other troubled, conflict affected areas.